An absolute essential staple for any environment that cares for young children, our Nappy Sacks are a hygienic and economic product option. Each one has been made from a lightweight and pliable plastic with tie handles and a gentle rose scent to cover unpleasant smells from within. They offer a convenient and hygienic way to dispose of nappies while allowing them to be stored with other waste for a short period of time. This large and economic pack of 300 bags is sure to last for numerous nappy changes while also storing away easily until required. 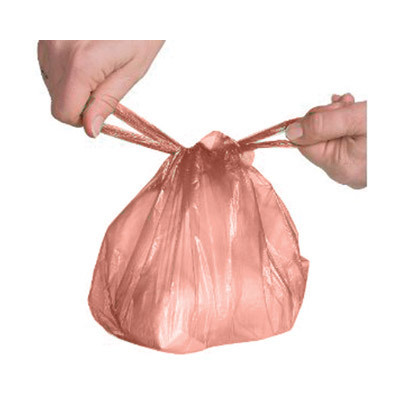 These nappy sacks are disposable in most standard hygiene bins found in public WC's with Haigh Macerator approval. Designed to work with you and your budget, we stock a wide range of nappies from varying brands and at the best wholesale prices. Choose from the Bamboo Nature Maxi Size 5 Nappies 60 or our Gompels Baby Nappy Junior Size 5 11-25kg 48 pack - to name a few.